Description: This tutorial is an introduction to FIWARE QuantumLeap - a generic enabler which is used to persist context data into a CrateDB database. The tutorial activates the IoT sensors connected in the previous tutorial and persists measurements from those sensors into the database. To retrieve time-based aggregations of such data, users can either use QuantumLeap query API or connect directly to the CrateDB HTTP endpoint. Results are visualised on a graph or via the Grafana time series analytics tool. Previous tutorials have shown how to persist historic context data into a range of databases such as MySQL and PostgreSQL using Apache Flume and Apache NIFIFurthermore, the Short Term Historic tutorial has introduced the STH-Comet generic enabler for persisting and querying historic context data using a MongoDB database. FIWARE QuantumLeap is an alternative generic enabler created specifically for data persistence into the CrateDB time-series database, and therefore offers an alternative to the STH-Comet. 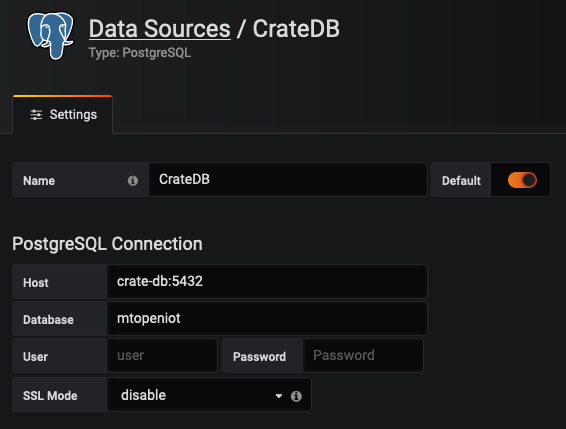 CrateDB is a distributed SQL DBMS designed for use with the internet of Things. It is capable of ingesting a large number of data points per second and can be queried in real-time. The database is designed for the execution of complex queries such as geospatial and time series data. Retrieval of this historic context data allows for the creation of graphs and dashboards displaying trends over time. Further details about the differences between the underlying database engines can be found here. Grafana is an open source software for time series analytics tool which will be used during this tutorial. It integrates with a variety of time-series databases including CrateDB. It is available licensed under the Apache License 2.0. 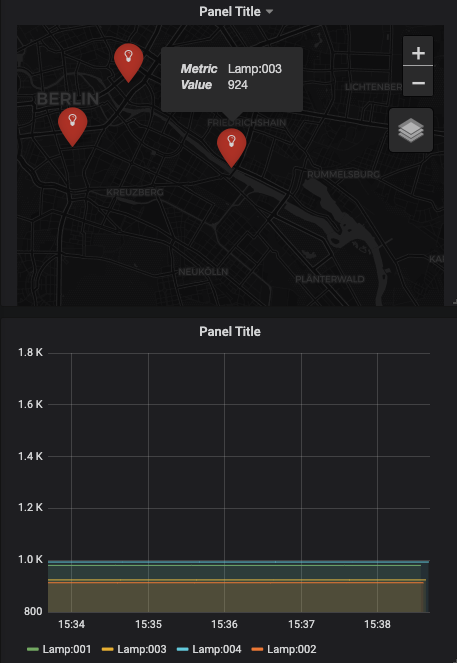 More information can be found at https://grafana.com/. This application builds on the components and dummy IoT devices created in previous tutorials. It will use three FIWARE components: the Orion Context Broker, the IoT Agent for Ultralight 2.0, and QuantumLeap . A Context Provider: - A webserver acting as set of dummy IoT devices using the Ultralight 2.0 protocol running over HTTP. - Note the Stock Management Frontend and Context Provider NGSI proxy are not used in this tutorial. 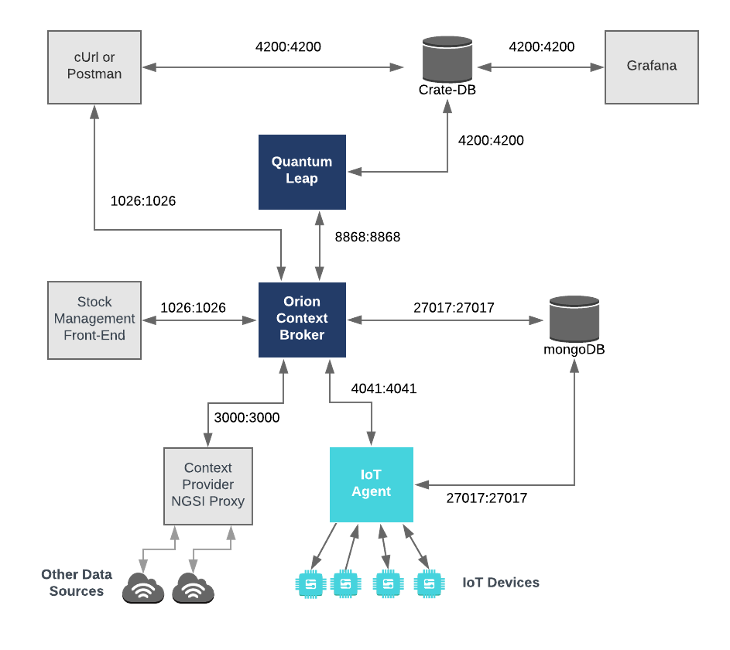 The Operations for port for QuantumLeap - 8668 is where the service will be listening for notifications from the Orion context broker and where users can query data from. The CRATE_HOST environment variable defines the location where the data will be persisted. Once a dynamic context system is up and running, we need to inform Quantum Leap directly of changes in context. As expected this is done using the subscription mechanism of the Orion Context Broker. The attrsFormat=legacy attribute is not required since QuantumLeap accepts NGSI v2 notifications directly. Subscriptions will be covered in the next subsections. More details about subscriptions can be found in previous tutorials or in the subscriptions section of QuantumLeap docs. The idPattern in the request body ensures that QuantumLeap will be informed of all Motion Sensor data changes. The notification URL must match the exposed port. The metadata attribute ensures that the time_index column within the CrateDB database will match the data found within the MongoDB database used by the Orion Context Broker rather than using the creation time of the record within the CrateDB itself. Before anything, check the subscriptions you created in steps :one: and :two: are working (i.e., at least one notification for each was sent). QuantumLeap offfers an API wrapping CrateDB backend so you can also perform multiple types of queries. The documentation of the API is here. Mind the versions. If you have access to your quantumleap container (e.g. it is running in localhost or port-forwarding to it), you can navigate its API via http://localhost:8668/v2/ui. Now, to check QuantumLeap is persisting values, let's get started with our first query. This example shows the first 3 sampled luminosity values from Lamp:001. Note the use of Fiware-Service and Fiware-ServicePath headers. These are required only when data are pushed to orion using such headers (in multitenancy scenarios). Failing to align these headers will result in no data being returned. This example shows the fourth, fifth and sixth sampled count values of Motion:001. This example shows the latest three sampled count values from Motion:001. This example shows last 3 total count values of Motion:001 over each minute. This example shows minimum luminosity values from Lamp:001 over each minute. This example shows maximum luminosity value of Lamp:001 that occurred between from 2018-06-27T09:00:00 to 2018-06-30T23:59:59. This example shows the latest four sampled luminosity values of lamps that are within a 5 km radius from 52°33'16.9"N 13°23'55.0"E (Bornholmer Straße 65, Berlin, Germany). If you have turned on all the lamps available on the device monitor page, you should be able to see data for Lamp:001 and Lamp:004. Note: Geographical queries are only available starting from version 0.5 of QuantumLeap which implements the full set of queries detailed in the Geographical Queries section of the NGSI v2 specification. This example shows the latest four sampled luminosity values of lamps that are inside a square of side 200 m centred at 52°33'16.9"N 13°23'55.0"E (Bornholmer Straße 65, Berlin, Germany). 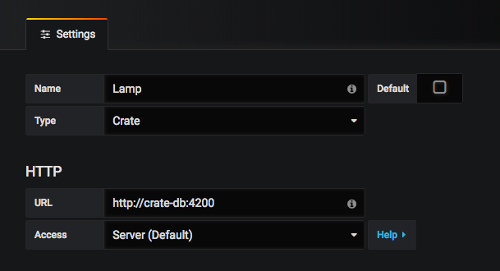 Even if you have turned on all the lamps available on the device monitor page, you should only see data for Lamp:001. CrateDB offers an HTTP Endpoint that can be used to submit SQL queries. The endpoint is accessible under <servername:port>/_sql. SQL statements are sent as the body of POST requests in JSON format, where the SQL statement is the value of the stmt attribute. Your experience will be closer to FIWARE NGSI APIs like Orion's. Your application will not be tied to CrateDB's specifics nor QuantumLeap's implementation details, which could change and break your app. QuantumLeap can be easily extended to other backends and your app will get compatibility for free. If your deployment is distributed, you won't need to expose the ports of your database to the outside. If your are certain your query is not supported by QuantumLeap, you may have to end up querying CrateDB directly - in this case please also open an issue in QuantumLeap's GitHub repository to inform the team. Schema names are formed with the mt prefix followed by fiware-service header in lower case. 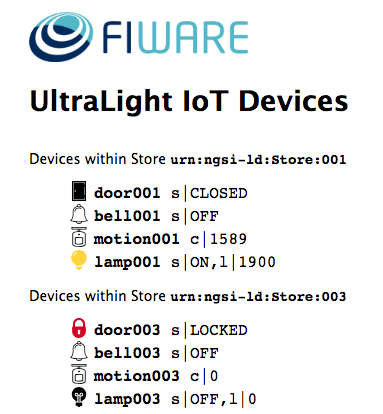 The IoT Agent is forwarding measurements from the dummy IoT devices, with the FIWARE-Service header openiot. These are being persisted under the mtopeniot schema. If the mtopeniot does not exist, then the subscription to QuantumLeap has not been set up correctly. Check that the subscription exists, and has been configured to send data to the correct location. QuantumLeap will persist data into separate tables within the CrateDB database based on the entity type. Table names are formed with the et prefix and the entity type name in lowercase. The response shows that both Motion Sensor data and Smart Lamp data are being persisted in the database. The SQL statement uses an OFFSET clause to retrieve the required rows. More details can be found under within the CrateDB documentation. The SQL statement uses an ORDER BY ... DESC clause combined with a LIMIT clause to retrieve the last N rows. More details can be found under within the CrateDB documentation. The SQL statement uses a SUM function and GROUP BY clause to retrieve the relevant data. CrateDB offers a range of Date-Time Functions to truncate and convert the timestamps into data which can be grouped. The SQL statement uses a MIN function and GROUP BY clause to retrieve the relevant data. CrateDB offers a range of Date-Time Functions to truncate and convert the timestamps into data which can be grouped. The SQL statement uses a MAX function and a WHERE clause to retrieve the relevant data. CrateDB offers a range of Aggregate Functions to aggregate data in different ways. CrateDB has been chosen as the time-series data sink for QuantumLeap, because, among many other benefits, it integrates seamlessly with the Grafana time series analytics tool. Grafana can be used to display the aggregated sensor data - a full tutorial on building dashboards can be found here. The simpified instructions below summarize how to connect and display a graph of the Lamp luminosity data. To display a new dashboard, you can either click the + button and select New Dashboard or go directly to http://localhost:3003/dashboard/new?orgId=1. Thereafter select the Graph dashboard type. To configure the dashboard click on Panel title and select edit from the dropdown list.